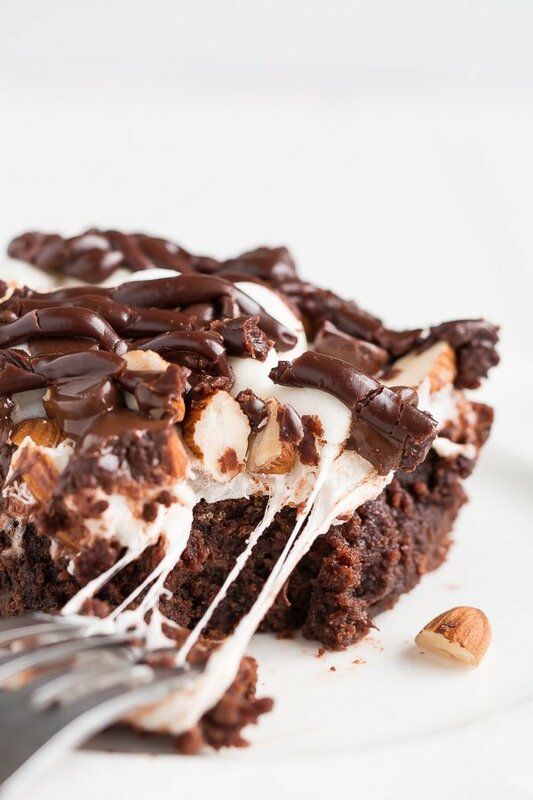 Rocky Road Brownies have a rich chocolate brownie base topped with a layer of puffy marshmallows, sprinkled with chocolate chips and almonds, and drizzled with chocolate frosting. Texture: Fudgy brownie with an ooey gooey marshmallow layer and crunchy almonds. Appearance: Gorgeous contrast of the chocolate and marshmallows. Though it can get messy, it’s the kind of gooey mess that makes these brownies irresistible. Pros: They are brownies. Enough said. Would I make this again? Definitely!!! Hi! I’m Melanie and I’m a chocoholic. Not a day goes by that I don’t eat some chocolate. Sometimes I can’t even get to 10am without grabbing a chocolate (I made sure to stock up on Mini Cadbury Eggs). I have a stash of candy and chocolate chips that would last a normal person a whole year, okay, maybe two, but lasts us 6 4 months! 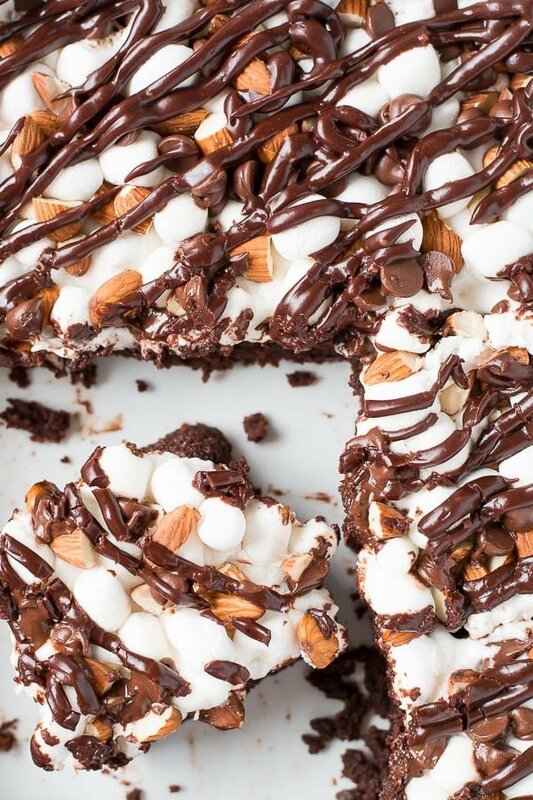 While I love eating straight up chocolate, my bigger weakness is for homemade chocolate desserts like German Chocolate Brownies and these AMAZING Rocky Road Brownies. Not only is the moist, rich, and fudgy chocolate brownie divine but there is more chocolate on top– chocolate chips AND chocolate frosting. And let’s not ignore that puffy cloud layer of marshmallows. Those little guys are tossed on top of the brownies for the last few minutes of baking just until they start to expand and get soft making them super ooey and gooey. It’s a mess of a dessert to cut up and serve (especially when warm) but usually the most delicious ones are! 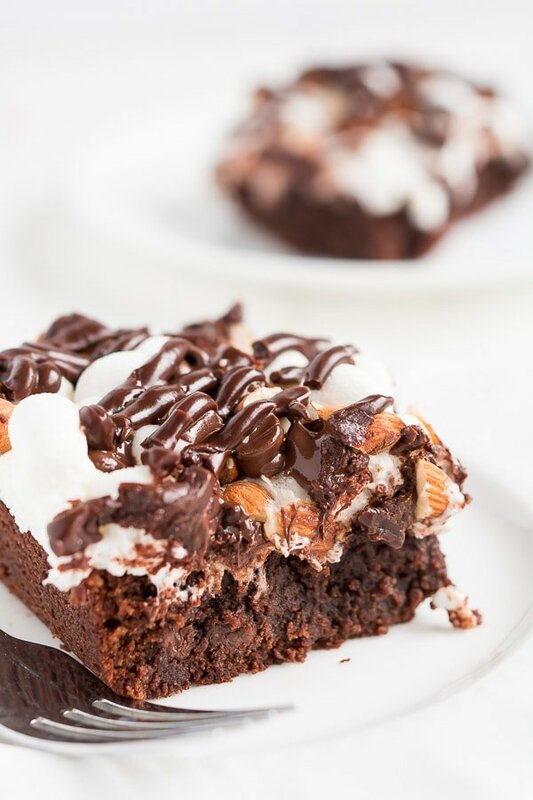 And to top it all off and make it “Rocky Road” almonds are sprinkled on top giving this dessert a nice crunchy texture that really stands out against the soft gooey marshmallow layer and fudgy brownie. These brownies are divine and so addictive. If you’re looking for a rich dessert, this is it! In a large mixing bowl, mix sugar and cocoa powder together. Mix in the melted butter, eggs, and vanilla until smooth. Add the flour and salt and mix until just combined. Folding the chocolate chips and then spread into the greased pan. Bake for 32 minutes. Top brownies with marshmallows, almonds, and chocolate chips. Bake for 3-4 more minutes until marshmallows start to expand. Mix frosting ingredients together until smooth. Drizzle over the warm brownies. Let brownies cool completely before cutting. Hi! I'm Melanie, from Garnish and Glaze, momma of one (almost two). I love making delicious food and sharing it with others. Moderation is what I live by so you'll find both healthy and indulgent recipes on my blog (nutrition facts included for all!). I am new to your site but love it! Just one request. Could you please add the YUM icon to your choices to save your recipes! Thanks so much. What kind of fat pig do you think I am no is perfect and if you think it’s e z to b me well guess again ,and remember you asked for my help Tessa and I did now leave me alone and hope luck on your website I am pretty sure your parents will Merry u off to. Some rich fu%$#ng weirdo .PS love to meet one sunny and hot day . so pretty pretty please kiss me before o turn into a forg u Royal beauty. 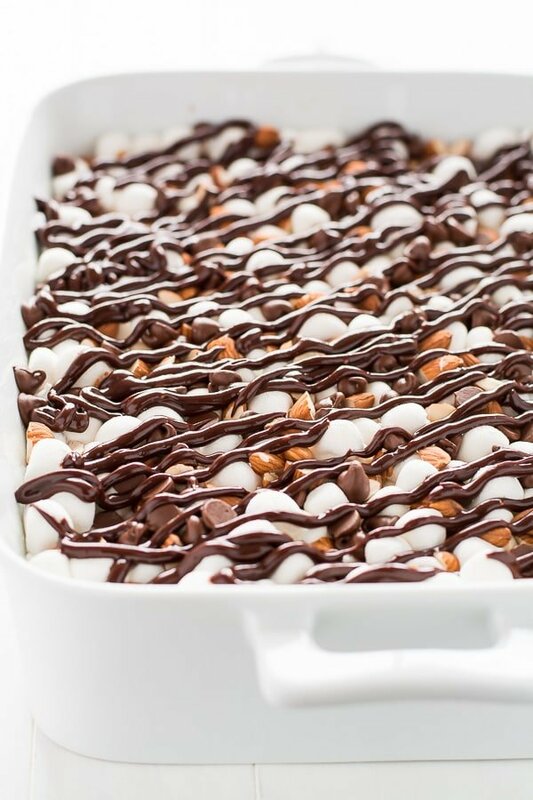 Do you use semisweet chocolate chips for rocky road brownie recipe? I love all the gooey chocolate and marshmallows on top! Thank you! To that commenter above, Jay, you need to get back on your meds!! I just made these. Thanks for a really good recipe. The only thing was that I thought the brownies were a little dry but the marshmallow helped to balance that. If I were to do it again I might add an extra egg yolk or something.